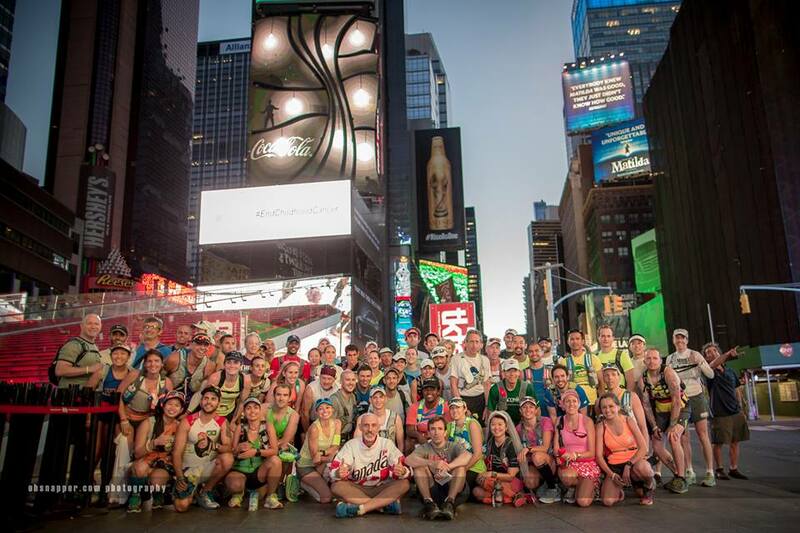 On June 21, I had the pleasure of being a part of the “Class of 2014” in The Great New York Running Exposition 100-miler, or the TGNY 100. 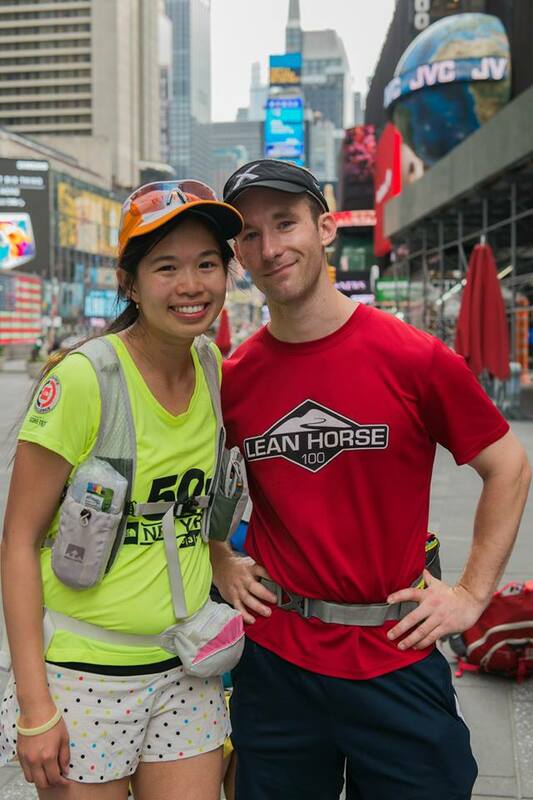 Ever since I had paced my friend Juergen last year for 26 miles, I was inspired and wanted to run it myself one day. After my DNF at the Bear 100 mile last year in Utah (dropped out at mile 61), a part of me was aching to prove to myself that I could run 100 miles for a second time, to relive that amazing feeling when I finished my first one at the Beast of Burden Summer 100 in 2012. 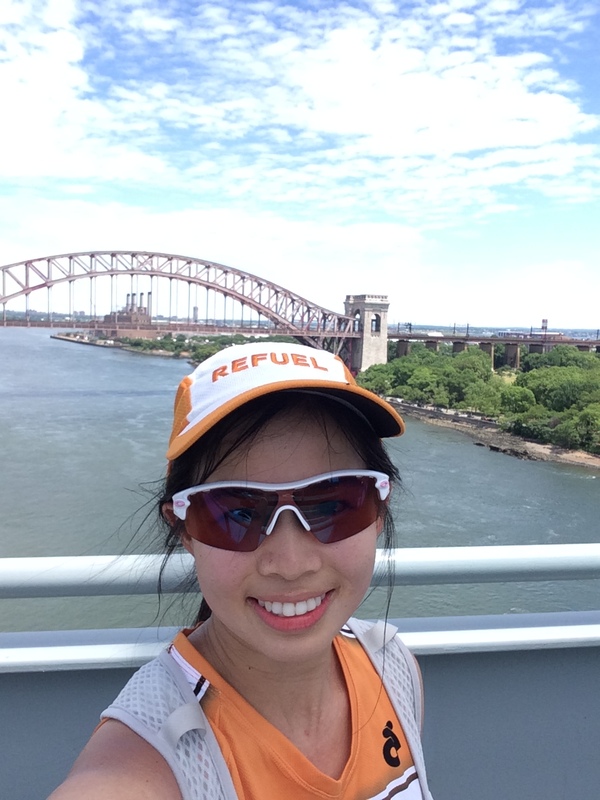 I am an NYC native, and I couldn’t wait for the chance to run through my hometown. The course started in Times Square, went up to Inwood, into the Bronx, through Orchard Beach, through Randall’s Island, Astoria, Alley Pond Park, Kew Gardens, and then down to Broad Channel and Rockaway Beach, Sheepshead Bay (Brooklyn), Bensonhurst, the Brooklyn Bridge, and finally through SoHo and ending in Times Square. It was an awesome course. I had an all-star team of pacers to support my journey–Ken, Tiffany, and Shane. I knew I couldn’t let them down, and Shane had promised that he wouldn’t let me drop out early at the 100K mark. On Tuesday before the race, Ken, Tiffany and I strategized at Num Pang Sandwich Shop. Ken would pace me for miles 36-51 from Astoria to Alley Pond Park, then Tiffany would pace me from mile 51 (Alley Pond Park) until the 100K mark (62 miles) at Forest Park, and finally, Shane would pace me from 100K to the finish line in Times Square. I am so fortunate to have my pacing team behind me, and I know that my race wouldn’t be possible without them. I had a goal to finish the race within 28 hours, which would be a PR for me (my best time was 28:23) and would give me a cushion before the 30-hour cutoff. I was feeling jittery the night before, picking out my outfit and not getting enough sleep because of my anxiety. I wore my Team Refuel/Got Chocolate Milk jersey and Skechers GoRun Ride 3’s, my most trusty gear and representing my awesome sponsors. Shane and I took the train to the start at 5:00 am to Times Square. Funnily enough, the Solstice Yoga in Times Square was the same day so there were people setting up for that event. I saw a lot of friends milling about pre-race, and my friends Donald and Karen were volunteering! Jackie and her family were there–Jackie’s sister planned it as her bachelorette party of sorts, getting a bunch of friends to crew her and surprising Jackie with a veil! It set the tone for the race to be awesome. All the runners got tech shirts and glow-in-the-dark wristbands instead of bib numbers. I was “bib number” 10, pretty cool. I had two water bottles, a Nathan running pack stuffed with food, and a printout of the turn-by-turn instructions. I was ready. I used the bathroom at McDonald’s last minute with a bunch of other runners, posed for pics, and then we were off! 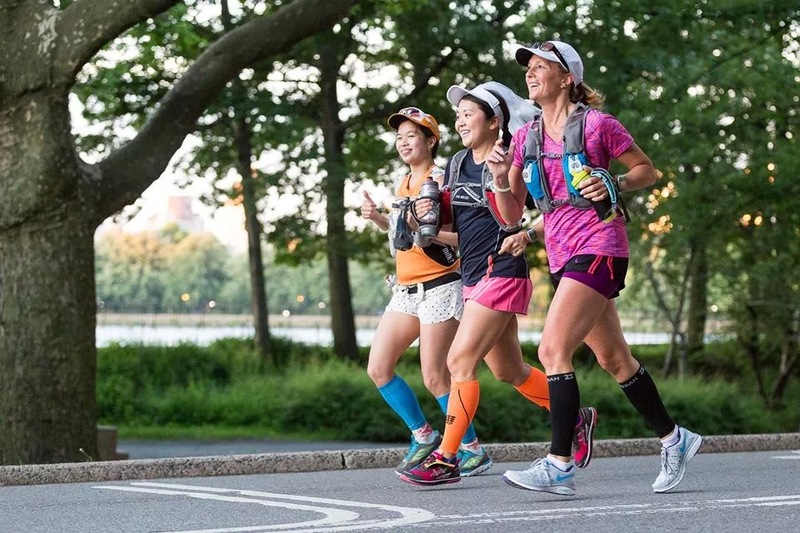 The course wound through familiar territory–Central Park and Riverside Drive at the beginning. We saw Mary volunteering and she made us blueberry bread, yum! I ran with Jackie and Robin for about 15 miles, then I felt like my pace was a bit too fast, so I hung back and ran alone for a little bit. Luckily, I found that Scott and Lucy were around my pace, and they were kind enough to direct me to where I needed to go and I ran with them for a while. In the Bronx, we found the place where garbage trucks were “sleeping.” Such a random sight! Running through Hunts Point near the Bruckner Expressway was emotional for me. I was a corps member with City Year (Americorps) right when I graduated college, and I served as a mentor/tutor at MS 302 in the South Bronx. I reflected on my year of service and mentally saluted the Bronx in my head for giving me a very meaningful first job. I was most worried about getting lost for the first 36 miles before my first pacer (Ken) picked me up. Luckily, that didn’t happen. One of the most memorable stretches was running in Pelham Bay Park towards Orchard Beach. It was a beautiful sight–I didn’t get to hang out, but there were awesome indoor public bathrooms! You learn to appreciate the little things when you run a 100! 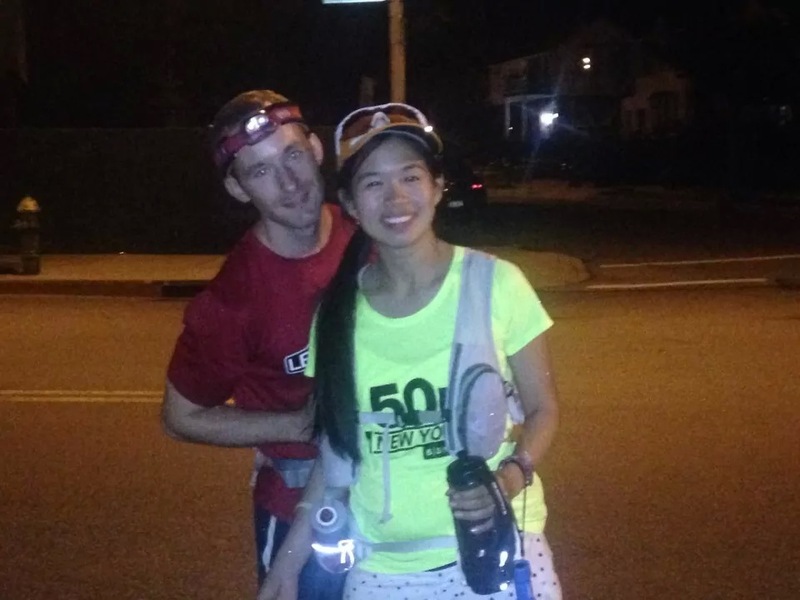 Lulu and Joe were volunteering at the aid station, which we saw twice at mile 21 and 25. I was so happy to see them! Seriously, thank you to ALL the volunteers. This race wouldn’t be possible without you. At mile 26, I was feeling good. Then I remembered I had 74 miles (roughly 3 marathons left to go). Darn. I would say the hardest part was running for a full workday, looking at my watch, and then still knowing that I had a long way to go. My strategy for this race (which I highly recommend) was to run from aid station to aid station, then pacer to pacer (luckily, there were 18 aid stations and 3 amazing pacers waiting for me). I broke the race down into 4 digestible pieces of 25 miles each. 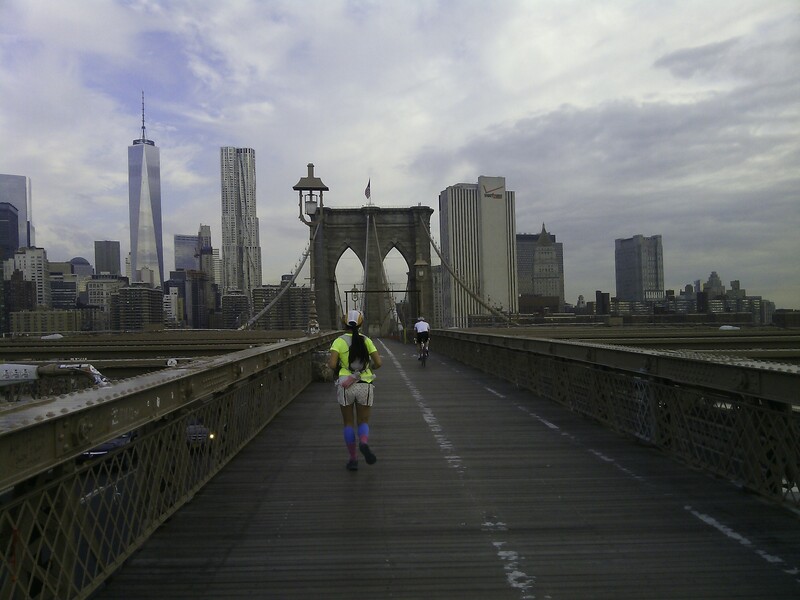 One tough part was in the middle of the day, running up a long uphill bridge from Randall’s Island to Queens. Most New Yorkers don’t know that Randall’s Island exists. 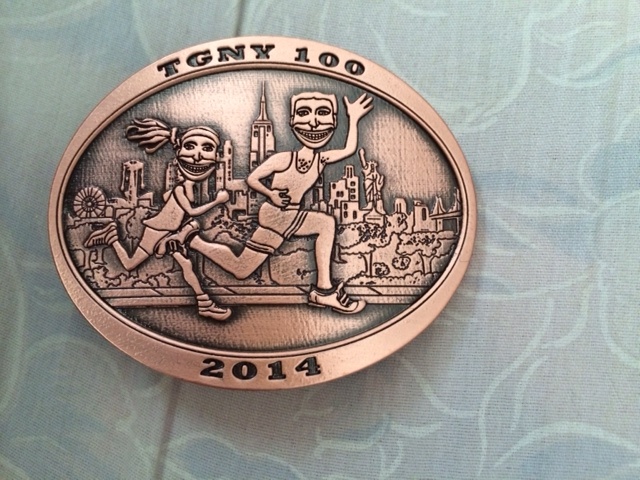 The special thing about the TGNY was that I ran through places filled with memories for me. When I was a student at Stuyvesant High School, I ran on the cross country and track teams. They built the shiny Icahn Stadium on Randall’s Island my senior year (for our track meets), and I dabbled in the 800m and 2000m steeplechase that year. I wasn’t very fast. I think my 17-year-old self would be proud of the runner I have become. At the mile 37 aid station, I got a second wind in the form of my dear friend Ken. For those of you who know Ken, he is a ball of energy, just what I needed! I was running slightly behind schedule and reached mile 37 around 1:00pm, an hour behind my very optimistic schedule (I had hoped for 12pm). Ken was glad to see me in one piece, and immediately asked me what I needed. He very kindly brought a battery pack to charge my phone–what a luxury! I saw Kino at the aid station too, said hello, and I was on my way. I remembered pacing Juergen in this section in Astoria, so I was glad to be in familiar territory. Ken kept me going at a solid pace, but I did shuffle my feet a little. It was a very hot part of the day and I had been awake since 3:00am, so I was pretty tired already. The miles did float past after awhile–Ken kept making sure that I was eating and drinking regularly. We even stopped by a grocery store where he bought me some gum and a juicy peach! The gum would save me much later. At World’s Fair Marina (mile 41), we saw Bee, Talisa, and Steven’s mom volunteering. I was so happy to see them! They had an amazing, well-stocked aid station. They had onigiri (rice balls) and fresh watermelon for us. I felt like I was in heaven. Thanks guys! The next 10 miles ran through Flushing and residential streets. The concrete was devilish–it made my feet feel heavy and my turnover was not as good. Although the course is mostly flat, the cement is killer and is one reason why this race can be quite difficult. 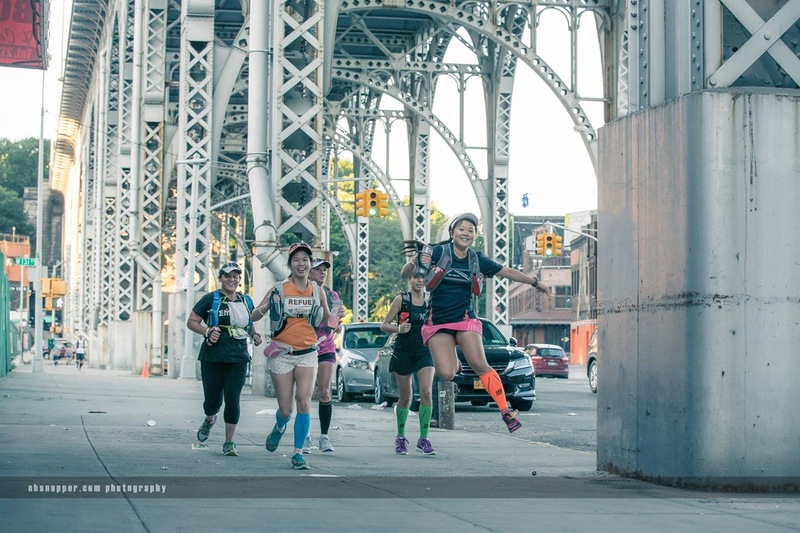 My second pacer and teammate Tiffany was running into traffic issues commuting to the 51-mile mark, but luckily it looked like we would be right on schedule for her to pick me up for pacing at Alley Pond Park in Queens. Tiffany was bringing me my favorite treats: Harmless Harvest Coconut Water, Kind Bars, and ibuprofen! Well, the first two are my favorites–the third one was for emergencies only. It was a relief to be drinking something else other than Nuun or Gatorade soon. See? I told you I have the best pacers and friends! When I saw Tiffany, I cracked a big smile. We were wearing matching Oakley shades that we had bought the week before! 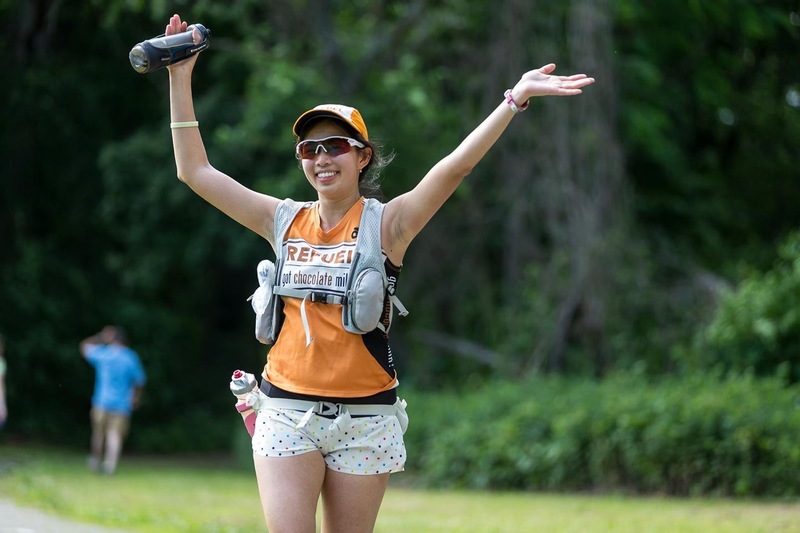 I had met her recently at the Ragnar Cape Cod, and here she was running 10 miles with me only a month later. Runners are pretty amazing people. I was still feeling pretty good, but I knew that the next 10 miles would be difficult. I had to make sure I kept fueling and stay at a conservative pace. 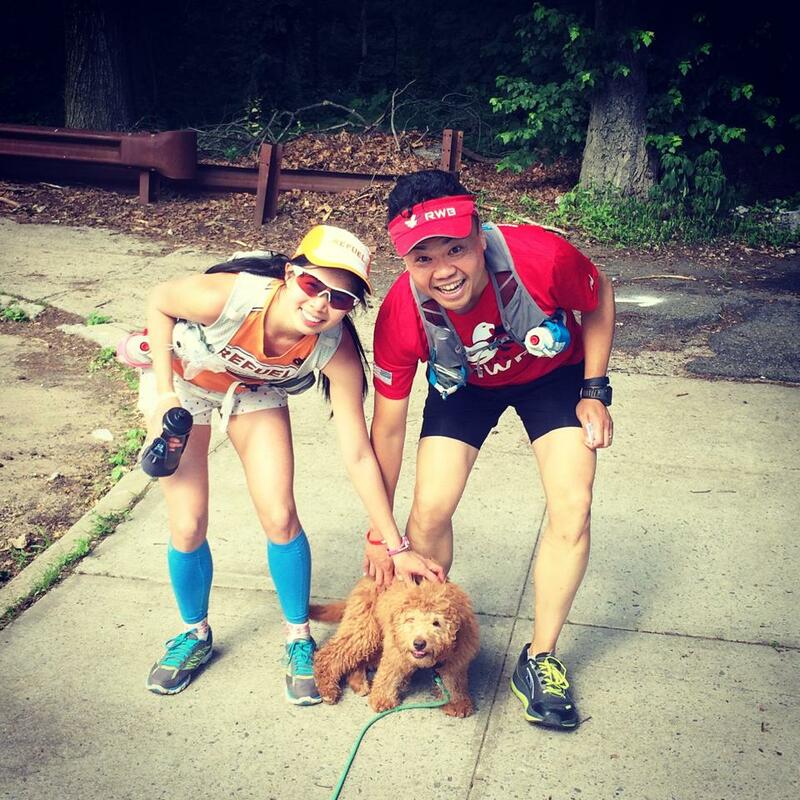 We had seen Jackie’s puppy, Yossi, at previous aid stations so that lifted my spirits too! 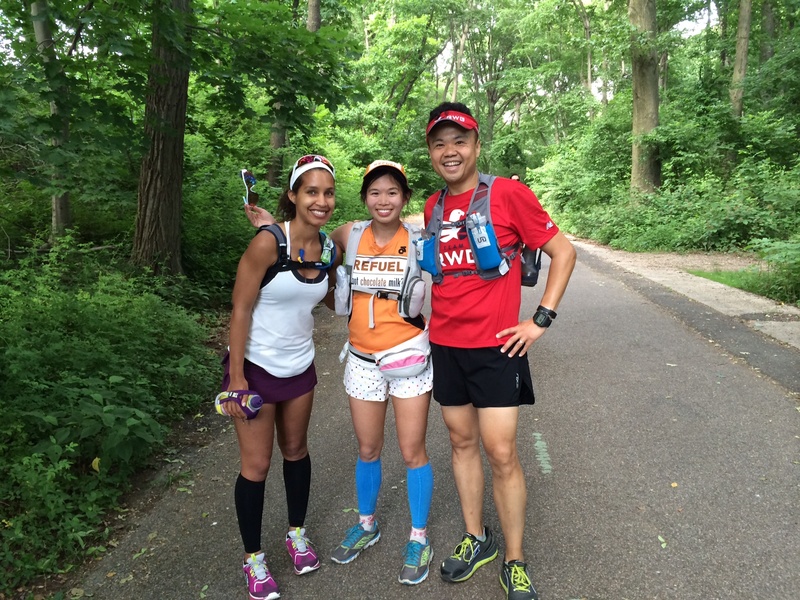 Tiffany and I chatted about past and future races, and it seemed to be just a regular training run in the park. 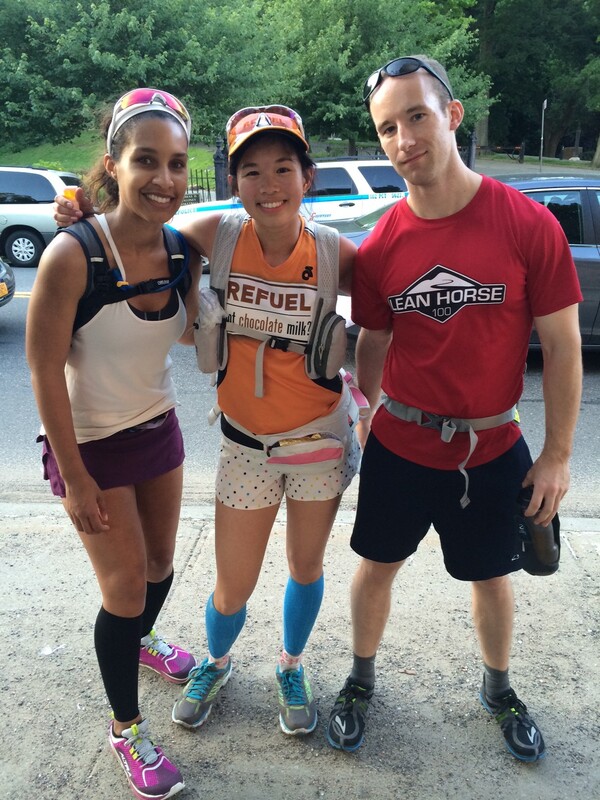 We ran through Kissena Corridor Park and saw Helen, Rob K. and Yossi! 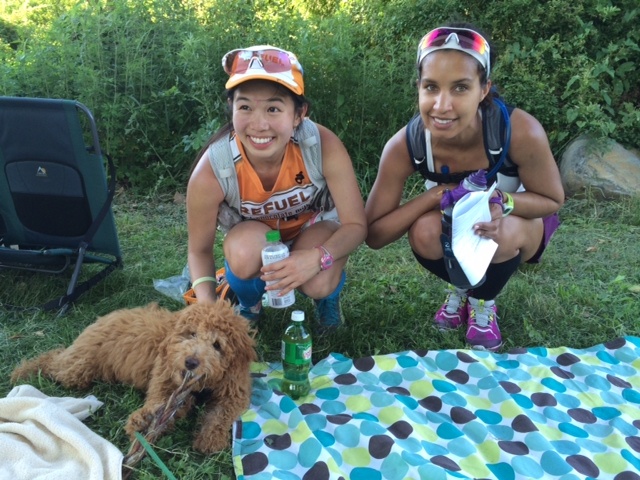 Puppies at aid stations? What a bonus perk for this race!! Me and Tiffany were really excited to see Yossi, can you tell? The next stretch in Flushing Meadows Corona Park seemed interminable. I had run in the park many times before, but my muscles felt pretty destroyed by this point so I was running pretty slowly. I stopped to use the bathroom and it was tough to resume running. The 100K mark loomed tantalizingly close, but still so far. We ran by the Kew Gardens F train stop, and Forest Park was just beyond that. I drank coconut water and took some ibuprofen to make my muscles stop protesting. It worked–at least for now. I only take ibuprofen during 100-milers–I generally avoid it otherwise. Finally, with Tiffany’s encouragement, I reached the 100K mark! We were pretty much on target with 14:31 for our split, only 1 minute beyond my hoped-for 100K split. I bid adieu to Tiffany and said hello to Shane, who was my secret weapon pacer for 38 miles. He has finished a 135-miler twice (the Arrowhead 135) so I really had no reason to complain during my 100! I sat down for about 20 minutes to pop a blister, eat a few bites of pizza and sweet potato, and change my shirt. I was afraid of sitting down too long and not getting up. I also had a “Mamma Chia” energy snack (similar to applesauce), but that was my whole dinner. Looking back, I should have eaten the entire pizza slice and consumed more calories–I definitely felt an energy deficit later on. I saw Paula, Cheryl, Michelle, Alison and so many cheery, familiar faces at 100K! It helped boost my spirits and I knew that I wanted to finish and make them proud. Shane and I left the aid station and quickly got back on track. We were running through the Howard Beach neighborhood–we ran by Vincent’s by the Bay, my friend Rob’s (Rob Petrocelli’s) favorite Italian restaurant. He passed away last year, and I thought of him as I ran by and prayed that he would help guide me to the finish as well (miss you, Rob!). Shane had paced this stretch with Juergen last year and I knew that I wouldn’t get lost under his watch. He was a brisk pacer, and he didn’t want me to walk much. It was much better to have him there so I wouldn’t slack off. As dusk fell, I felt more and more lethargic, but I had one goal only: to get to the finish. We reached Adabbo Bridge aid station and there was a lone volunteer. We checked in, and as we crossed the bridge, we saw a magnificent pink sunset. There were fishermen hanging around the bridge, and they curiously glanced up at us runners. Mile 71: We reached the Rockaway Beach aid station, and I slowed down a lot. Shane pretty much commanded me to eat some trail mix, as I complained of nausea and not wanting to eat another granola bar. I really wished I had packed some more savory snacks in my pack, as I didn’t want anything sweet. It was right around here that I started feeling sick. I had to go to a bar in Broad Channel to use their bathroom. Luckily, they didn’t ask questions about my running attire and let me right in. Broad Channel feels like a small, sleepy beach town–it’s quaint! Shane told me not to dawdle too long, as he had set a goal for me to reach mile 75 by midnight. Mile 75: Jacob Riis Park–there were two lovely volunteers who were originally from London. I remembered I loved hearing their accents, haha. 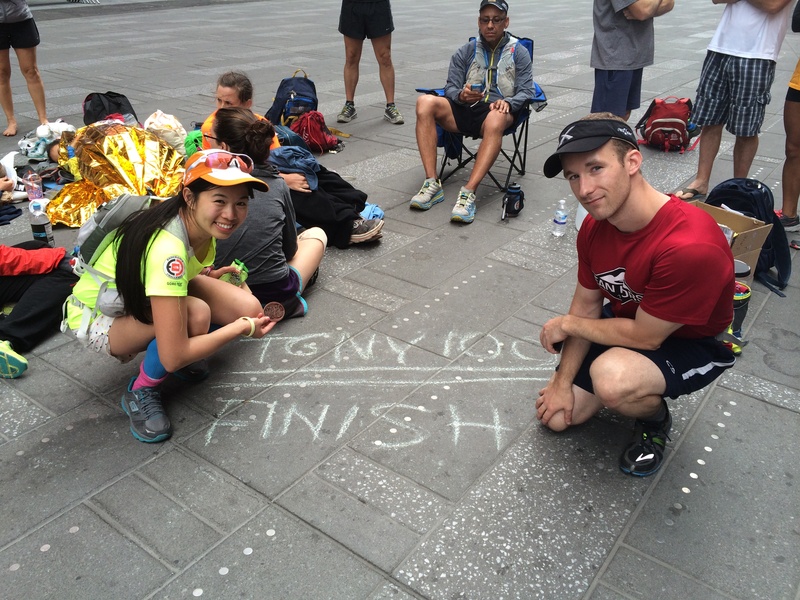 One was a past participant of the TGNY 100, and he offered us cookies and chocolate pudding. It was starting to get a bit chilly, and I wanted to do nothing except lie down. My body was literally going into sleep mode. On the bright side, we reached mile 75 at 11:30pm! I had run roughly 3 marathons in 18.5 hours–definitely something to be happy about. Mile 80: Around Miles 77-79, Shane and I were running in the pitch dark to Brooklyn. We nearly took a wrong turn, but luckily we found our way after some fumbling around in the dark. I literally couldn’t eat another granola bar without wanting to puke. My skin felt clammy, and I just felt weird in general. I couldn’t tell if I was drinking too much water or not taking in enough salt–possibly both. I saw my friends Annette and Jess, and Jayne and her daughters (Jackie’s family), and told them I felt horrible. I sat down for a few minutes while Jess handed me chicken broth and pretzels. Shane told me to eat some potato chips. I just wanted the terrible feeling to pass! The next few miles after 80 seemed the longest ever. Around 2am, we reached the “boring stretch” that Shane had warned me about. The Verrazano Narrows Bridge loomed far off in the distance for a good 5 miles, and we had to run toward it and under it. I stopped to use the bathroom about every 45 minutes because of my digestive issues. It was bad. We see a man with a bike, green lights flashing and loud techno music blaring, all by himself near the bridge. It was comical, but if I was alone I probably would have been scared! Shane and I walk for most of the 5 miles, with a few short runs in between. I felt blisters forming under my feet, and it became super painful to run and walk. As the sun finally starts to rise, we are approaching the Leif Ericsson park at Mile 90, where my friend/pacer Ken was volunteering. He had gone to a wedding after pacing me, and he promised to wait at the aid station for me in a full suit. I saw him, gave him a quick hug, and told him I was feeling really bad. He gave me a bag of Lay’s cheesy garlic bread chips and it cheered me up a bit after a few bites. I couldn’t let them down. I wouldn’t. I thought of how much I had learned from that and what a different challenge this was for me. I thought of all the 1038915 crazy reasons why I love running and the way it makes me feel alive, how lucky I was that my body is able to do this. I reached the aid station at Mile 95 at Borough Hall, Brooklyn, and I had a measly 5 miles left to go. I gave the volunteers a big hug, broke down crying on Mary’s shoulder. She told me I was doing great, and gave me something I could finally eat–a packet of applesauce!! We reach Union Square, and it’s just a mile up Flatiron and to the finish line at 44th and Broadway. There are some pedestrians by now, 7:30am. I thought of how I asked my mom to wait for me at 9am. It occurred to me that I might even finish before she gets there. I run by the Broadway Bites food festival tents set up in Greeley Square, and I distinctly think about them being in my way! I have to run on the sidewalk instead. I am counting down the individual blocks at this point. The flashing lights of Times Square twinkle at me in the distance. I run by the Ruby Tuesday, under some ugly scaffolding, and I look up at 42nd and Broadway. I hear clapping! The finish line was 2 blocks sooner than I had thought–last year it was at 44th Street. I smile and run towards my friends and fellow runners who had gathered at the finish. I see Phil, the race director, standing at the finish. He gives me a big hug and hands me the finisher buckle. I thank him and give Shane a hug for running 38 miles with me. I let all the emotions wash over me, and I cry because I can finally stop running! Words can’t describe how it feels to finish a 100 miler. It is painful, it is crazy, and it’s pure bliss once you are finally done. I had finished in a time of 26:36:10, a 1 hour and 47 minute improvement from my previous best time! It has been an amazing run. Thank you to everyone who has helped me in this journey–Shane, Tiffany, Ken, all the volunteers, and the co-race directors Phil and Trishul. 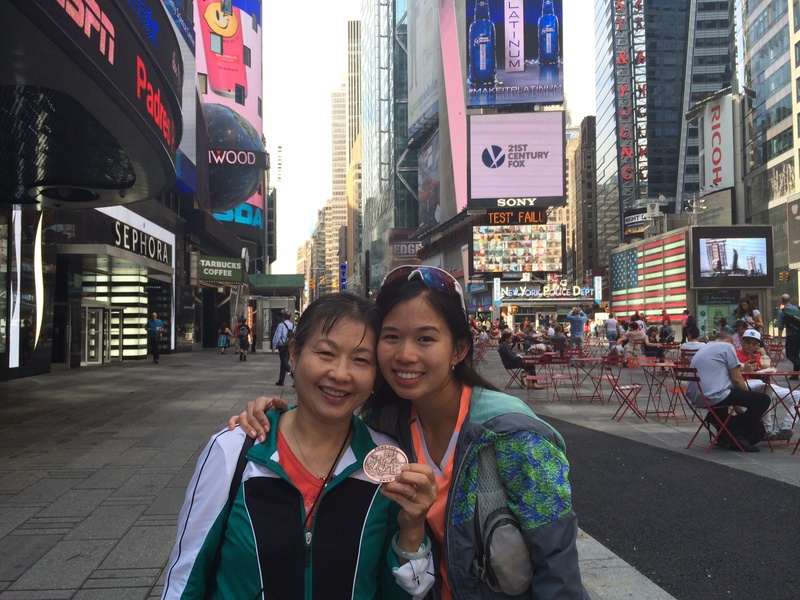 Thanks to my mom who waited for me at the finish! Also, congratulations to my fellow runners–you are all inspiring. Thank you to my co-workers and friends who sent me messages of support. It meant the world to me! Now that I am rested and recovered, I can’t wait until my next adventure. I love you, New York! Categories: Ultramarathons | Tags: 100 miler, Brooklyn, Great New York Running Exposition, Harmless Harvest coconut water, Kind bars, New York 100, Phil McCarthy, Skechers, TGNY 100, Times Square, ultramarathons | Permalink.